My first taste of Indian food came on my first trip to New York City to meet up with some friends and to celebrate the New Year in 1979. Yep, I saw the ball drop (more near than at Times Square) to welcome in that wonderful decade the '80s. At the time, I felt like I was in another country - the streets seemed old and narrow (and dirty), and everywhere we went I heard different languages being spoken around me. I no longer remember too much of where we went, what we did, and what we ate (although I do remember most breakfast specials were around $3.99, but you had to get up at some ungodly hour of the morning - like 9:00 or something - to take advantage of those fabulous deals. The only time I made it was our first day there and that was only because we arrived at 5:00 in the morning and got into Manhattan too early to bother our hosts so we stopped at a diner and ate breakfast. And I remember the Indian Restaurant where a huge group of us went for dinner one night. I have no idea which one it was, or where it was, or much beyond that, except that it was full of the most wondrous aromas I had ever experienced. Not knowing anything about it, I was happy to let the others order, and to just enjoy the experience. I know we had Naan and I suspect we had tandoori chicken, but I don't remember any other specifics except for the fragrant rice (maybe some biryani?) and exotic vegetables. Oh, and I remember that it was all absolutely delicious, and I wanted more. When I returned home to Austin, I went a few times to the one Indian restaurant that I was aware of at the time, but I didn't really know what to order. Everything was good; it was just always a crap shoot and I hadn't paid enough attention at the restaurant in New York to have the faintest idea of for what I was searching. I looked up a couple of recipes, but I always folded against the unfamiliar ingredients. There were spices of which I had never heard, home-made cheese, bread that you cooked on the side of the oven, and master blends of curries that I couldn't even begin to think where to start to recreate. And there was ghee. Every dish seemed to call for ghee. It seemed to be related to clarified butter, of which use I only knew was as a dipping sauce for lobster and had never made before, and it seemed like a lot of work to create an obscure, enigmatic entity. I moved on. And then I moved to Chicago, where I discovered the restaurants of Devon Avenue. They were many, and they were wondrous. There were even - wonder of wonders - Indian restaurants scattered elsewhere around the city too, with three - count 'em three! - in my neighborhood alone. I got more comfortable with Indian food, and more familiar with it. But I still did not have the nerve to try my hand at cooking it. A few years later, I got a copy of Madhur Jaffrey's World Vegetarian, and as I looked through the recipes, some of them actually looked do-able. My first attempt, Spicy Eggplant Stew with Potatoes, Mushrooms and Chickpeas, came out so well that I was encouraged to try more. One thing led to another and, fueled also by my desire to eat more healthful vegetarian fare, I was cooking Indian food before I knew it. But there was still one ingredient I was avoiding. 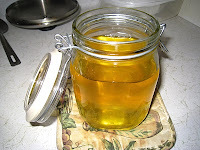 Any time I ran across ghee in the list of ingredients for any recipe, I automatically substituted oil. I knew my dishes would never reach the same level of flavor without it, but I had no idea how to get it and it never really occurred to me that I might be able to make it myself. Then I saw it on sale at the Big Apple Market, in a cute little jar. I picked it up, thinking it might be worth trying until I saw the $10.00 price tag. I quietly put the cute little jar back on the shelf and quickly scurried away. But I knew what it looked like, and I think that gave me the courage to finally think about trying to make it myself. And I found that it wasn't nearly as scary as I thought it would be. I did a little searching, and discovered a few things that gave me confidence. One was that it lasts for quite a while if kept dry, and it doesn't need to be refrigerated. The more I looked at the method the more intrigued I was, and the more determined I became to try it. And I have to tell you, I am so glad that I did! 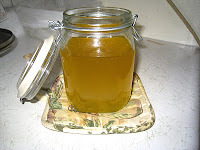 Ghee has a rich, nutty taste that makes me feel all warm and toasty just with the smelling of it. It is solid at room temperature, melts quickly and easily, and actually has a higher smoke point than most vegetable oils. It browns beautifully, and adds that same nutty flavor to whatever is cooked in it. It even makes fabulous popcorn! 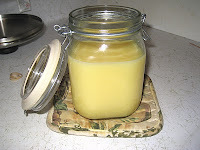 If kept dry and well-sealed, ghee will keep for months at room temperature. So what are you waiting for? Ok, maybe you're as intimidated as I was at the thought of making it. Silly you. Have I ever let you down before? Just follow the steps below, and you will be amazed at how easy it is to make this wondrous concoction. 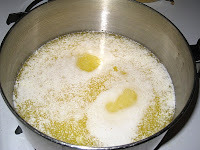 Put 1 to 2 pounds of butter in a 3-quart solid-bottomed heavy saucepan and melt over medium heat. 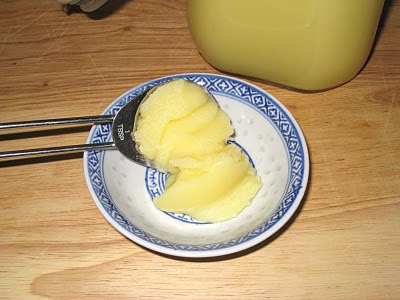 This is what it looks like when the butter has just melted - it is yellow and liquid, with few bubbles. 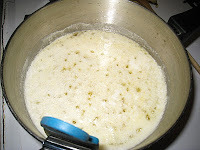 Once the butter has melted, the solids will begin to separate from the liquids and it will start to get foamy on top. As the water starts to evaporate, you will start to hear it boiling. That's fine. That's what it's supposed to do. Just when you start to wonder when it will reach the next step, the foam will start to disperse around the edges of the pan, and you will be able to see the liquid below. It is still opaque at this point, so just let it keep on boiling away. You want it to be a slow boil, with just an occasional bubble here and there. If you have the heat too high, you can burn the milk solids. 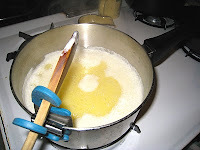 If you burn the milk solids, you have ruined your ghee because the flavor will permeate through the oil. If you leave the heat at medium and lower it a little if it gets too happy, it will be fine. The solids have closed back over the liquid, but you can see that it has developed a little bit of a crust-like consistency. At this point, you can take your wooden spoon and kind of skim them back and get a glimpse of the liquid below. 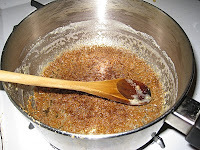 At this point, the liquid will be transparent, because the solids have started to sink to the bottom of the pan. 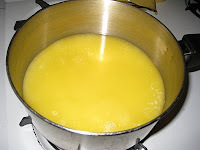 Once the water has boiled out of the mixture, your ghee is basically ready. Now all you have to do is decide how nutty and brown you want it to be. I didn't get as clear a picture of the translucent liquid through the foam as I thought I did. At this point, you want to periodically skim the foam to the side so you can keep an eye on the liquid. You will be able to see the solids that have fallen to the bottom of the pan, and you want to make sure they don't burn. They can brown; in fact, you want them to brown. And there's a pretty broad range at which you can stop and it will still be ghee, so if you are a little nervous the first time and don't let it get as brown as it could, it will still be ghee and it will still be delicious. Once you have decided your ghee is done, you want to remove it from the heat and pour it carefully into a measuring cup. Be sure to put a metal spoon in the cup to help keep the glass from breaking - this stuff is hot. Which bears repeating. This mixture is incredibly hot so you want to be very careful when you are pouring it into the measuring cup. 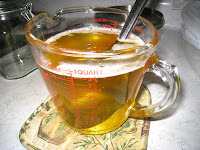 Also be sure that your measuring cup is big enough to hold all of the liquid. You will lose about half a cup making ghee, so if you are using 1 pound you will need a 2-cup measuring cup, and if you are making 2 pounds you will need a 4-cup measuring cup. I started with 1 pound of butter; now I make it in 2 pound batches. You can see how translucent it is in this photo. 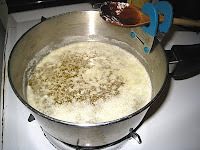 You want to pour steadily in a slow stream so that you can leave the solids in the pan. You can see how much was left down there. You can see I let it get pretty brown in there. I could have probably gone a little further, but I didn't want to risk burning it. You can eat the solids if you want - I've heard that it's really good on toast. To me, that kind of defeats the whole purpose of making ghee though, so I just throw it out. After it has cooled for a few minutes, put cheesecloth in a strainer and again, slowly and steadily, pour the ghee from the measuring cup into your storage container. I have this wonderful wire bail jar that has about as close to an airtight seal as you can get. I have a bigger one that I use to store my brown sugar and it has never, ever, dried out on me. Here's what it looks like after an hour or two. You can see that it has become a little more opaque, but it doesn't look like it will become solid, does it? Surprise! It does! It was past my bedtime and it still hadn't cooled completely so I went to bed. This is what I woke up to in the morning - Yum! And that's it. I'm telling you - you have to try this stuff. It is like liquid gold. One-and-a-half billion Indians can't be wrong.